Dental phobia is a common and serious fear of seeking dental treatment. Fear is an acquired behaviour which means it is possible to deal with it under the correct approach which can vary among individuals. Patient centred behavioural motivation that sees you as a whole person and not just as a set of teeth can help you deal with your fears related to dental treatment successfully. Knowledge of your dental conditions and necessary procedures is crucial to alleviate the fear of the unknown . Explanation and clarification of all dental procedures is essential before commencing dental treatment on every patient. Feel comfortable to ask your dentist questions with regards to the nature of intended treatment . Do not be embarrassed telling your dentist how much treatment you can tolerate on a given time and more important at he beginning of your dental treatment. As you build confidence in your self and you gain trust in the team caring for you the length of your appointments and the amount of work undertaken can be increased. Communication with the dental team while being on the dental chair It is important that a signalling system is established that will allow you to express yourself while being treated whether the anaesthetic has worn off or want to rinse your mouth or need a break . The most common signal during dental treatment is by raising your hand. A relaxed body promotes a relaxed mind. If you feel tense on the dental chair the easiest way to relax is through diaphragmatic breathing . Ask you dentist for a break in order to practice the above breathing exercise prior to starting a dental procedure and /or during the dental procedure if possible . Slow breathing through your nose while having your mouth opened during a dental procedure will promote and sustain relaxation . The noise from the dental equipment can be a constant reminder of past traumatic dental experiences and can delay your ability to relax. Low-moderate volume of lounge music of your preference can masque the noise effect of the dental equipment and create an environment where relaxation techniques are more effective. As you get more comfortable on the dental chair you can engage in more intense distraction techniques such as using a personal MP3 player. The above distraction technique is only recommended once you have established enough trust and confidence because your ability to communicate will be compromised. Modern dentistry has developed new techniques with regards to make dental injections less painful and more comfortable. Dental injections can be painful and this has a lot to do with the speed of administering local anaesthetic as it is done ‘’manually’’ by the dentist’s hand. The practice offers the Wand System of dental anaesthesia where the local anaesthetic is administered very slowly via a machine that regulates the speed and amount of anaesthetic required. We also use topical anaesthetic cream prior to the dental injection which offers additional comfort and re-assurance . The practice offers a counselling service for these patients however, in majority of these cases we would recommend intravenous sedation which is a form of conscious sedation . Oral sedation with valium tablets is another alternative form of conscious sedation but it is less controlled in contrast with intravenous sedation and would work more towards relaxing the patient rather than sedating. Too good to be true, dentists know that patients hate ”the needle”. 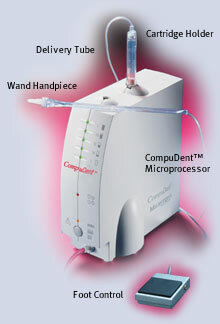 The answer, a small hand piece that looks like a pen controlled by a computer allows the dentist to anaesthetise even the most difficult tooth virtually painlessly! Cosmetic Dentist in Barkingside, Ilford – Dentist in Redbridge, Essex running the nervous patient’s management programme to carefully handling the nervous patients.